Risk management is crucial on any IT projects. It is a core activity of project management discipline, already well documented in Prince 2, PMBOK or CMMI (thus it is an essential part of an Agile CMMI model, expected by some of our client). In an Agile-CMMI context, it’s a must ! The Good News … with adjustments, risk management is clearly more powerful with Agile methods. It is a great strength (often ignored or hidden). Monitored on a daily basis, the Agile Risk Board becomes a key element of the Information Radiator (with Task Board, Burndown chart, and User eXperience artifacts). IS AGILE RISK MANAGEMENT DIFFERENT ? HOW DO WE DO AGILE RISK MANAGEMENT ? I plan the Risk management activities, and invite the team to determine how to best manage risks (depending on the context, Agile only, Agile-CMMI …). This is a short exercise that describes how agile management will be done in the specific project. Required, process oriented but useful and no time consuming. Collectively during a workshop we seek to identify risks and prioritize them according to conventional parameters (probability of occurrence and potential impact). Taxonomy, check lists and brainstorming ! Classic. The beginning and the end of each sprint are important milestones. Risks are formally included in the agenda of the Sprint planning meeting and Sprint Review. They are discussed with the team. A good thing if the Agile Project manager needs to report. Risks are assessed and managed with strategies for addressing them during all Scrum meetings. 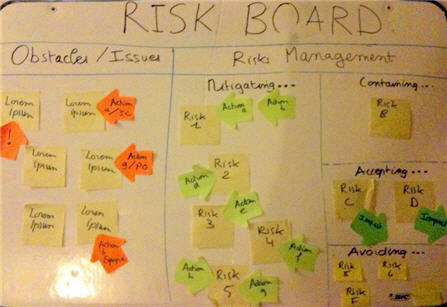 Strategies (Mitigate, avoid, transfer, accept ), associated risks and actions are written on the risk board (as the example above). Risks are continuously monitored on the Information radiator, mainly through the Risk board but also with the Task board and BurnDown Chart (immediate visible result of good or ineffective risk management strategies). Risk management is now collective and HIGLY VISIBLE. IS THE AGILE RISK MANAGEMENT CMMI / PMI COMPLIANT ? Yes it is !Concerning risk management, PMI, the Project Management Institute (via PMBOK) and SEI, the Software Engineering Institute (via CMMI) have almost the same approach. The agile risk management and its specific practices described above enable you to answer these three objectives and to get direct or indirect evidences needed in appraisal contexts (SCAMPI). One more time, the 5 processes map very well with Agile Risk management practices, even if the Agile Project Manager acts more as a facilitator. THE BENEFITS: risk management is highly visible, monitored on a daily basis and is everyone’s business. very good article. I think we will try this in our team. 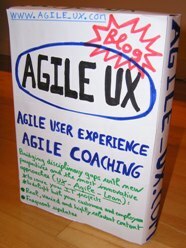 we’re always looking in something new in agile practices. There’s only one question. Could you describe in more details the structure of this risk board please? Maybe via email. Too many folks don’t take the time to see how so many different techniques really are trying to accomplish the same thing. Once this is seen, it is much easier to integrate various effort together – in complimentary ways. This is really great post. almost cover the risk management of scrum. am doing masters reaserach on scrum risk management. i prepared most of the questions from this post and solutions also. is it possible to contact through mail, i really need your great asisstance. How to make decisions on risk prioritization and who is involve in the decision making team. the whole scrum team is going to solve the risks or only particular members are assigned..